The long-awaited Blockmarket Desktop 3.0 (BM3) was released on June 25th. The BM3 wallet contains several updates including the ability to easily create an Alias (which is a human-readable alternate for a Syscoin address) and is also the world’s easiest and fastest way to tokenize assets, both digital and real-world. Assets can be fungible, non-fungible, and generate interest; additional asset-centric features are slated for upcoming releases. Non-fungible tokens are an upcoming trending feature on Ethereum — Syscoin already has them! Blockmarket Desktop 3.0 is a complete overhaul of the entire Blockmarket technology stack for improved searching and scalability through off-chain services. This release of Blockmarket Desktop is the first to feature support for new features of Syscoin Core 3.0 such as Assets and other improvements. A unique asset creation portal: Create, send, mint and collect interest on Syscoin Assets, with just a few clicks of your mouse. Crowdfund your venture, assign tokens to your physical assets or securities, assign loyalty points to your customers, all with just a few clicks. Identities and aliases: An Alias is your blockchain username and is essential for Syscoin services. You can create an Alias and assign it your own public Identity; display your image, social network links, and any other public information you wish to share. Link a specific wallet address to your alias and easily send Syscoin from your Alias to another, replacing the need to remember long wallet addresses. Escrow: Establish trust in your cryptocurrency transactions. Assign a 3rd-party arbitrator, ensuring both parties respect the terms of an agreement. Certificates: A valuable feature that allows you to store private data on the Syscoin blockchain. Create, store, and validate critical data. Built-in wallet and funding manager: Don’t have any Syscoin? Purchase Syscoin with up to 32 different cryptocurrencies directly in the application. Upgrading Simplified: A simplified upgrade path from the previous Syscoin/Blockmarket applications; now has built-in import/export functions. Syscoin QT 3.0.6 released, a mandatory upgrade! Syscoin 3.0.6 is released and is a mandatory upgrade for all exchanges, masternode holders, and general wallet users. The Syscoin 3.0.6 core is included in the Blockmarket 3.0 release. Includes a hotfix for superblock creation failing when a transaction is also mined in the same block. The fees were not properly accounted for during that special block creation which caused clients to see an error message and fail to process block. If you experience this, you should upgrade to proceed to validate blocks. List service function bug fixes and cosmetic updates. Ensure that dust change outputs are not created when creating syscoin transactions. Testers were complaining about seeing a dust error when updating aliases which this should fix. 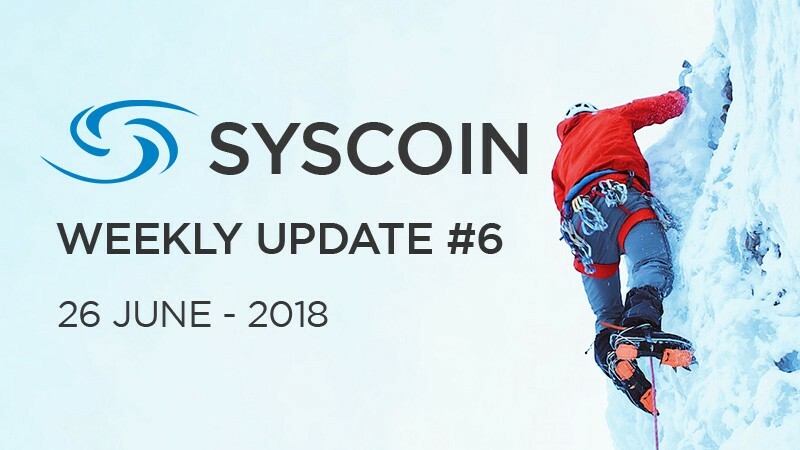 Please read further below in this weekly news update how you should upgrade to Syscoin QT 3.0.6. Last week Sebastian Schepsis (CTO of Blockchain Foundry Inc.) and a few of the team attended the Bahamas Blockchain & Cryptocurrency Conference 2018 (BBCC 2018). Sebastian did a stage presentation to an enthusiastic crowd, they met with numerous potential partners and the team live tweeted from the event, trending #1 on Twitter conference coverage. Please have a look at our newly released website! You can find all kinds of information about Syscoin and the community there. Enjoy your stay at syscoin.community! We are pleased to announce that Locutus is joining JohnP on the Telegram moderation team. Syscoin 3.0.6 is released and is a mandatory upgrade for all users. You do NOT have to press the start button after updating the node. Pressing that button will reset your qualification time and make you wait for |masternodes| * 2.6 / 60 hours for rewards. At the moment of publishing there are ~1145 masternodes online. Masternode daily reward calculation: 37411.2 SYS per day divided across the number of active masternodes (Currently ~1145). ‘Seniority’ will get you +3% ROI on your block reward for every 4 months running your MN. For example, after the first 4 months, you will get 25.98 + 3% = 26.77 rewards per block. Latest release wallet for creating/managing masternodes is QT 3.0.6. Latest release for Sentinel is 1.1.1.